In a moment of utter genius, I managed to delete the bentos I had saved to fill in this Christmas week with at least a couple of posts. So much for that plan. So plan two involves some of my other cooking adventures. 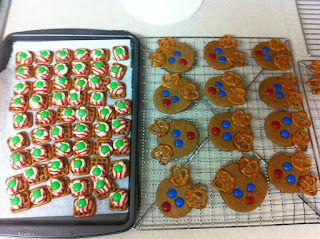 This week, for The Kids Cook Monday, F&B and I have been making Christmas cookies. Now I've made several other kinds, including sherbet macaroons, almond fudge, jam filled sugar cookies and chocolate peppermint ones, but these two were the most kid friendly. iPhone picture, the real camera was drying out from a water incident. Zebra nibbles aren't exactly cookies. Use grid pretzels and top each with a Hershey's Hug, or we used Peppermint Kisses. Bake for about 5 minutes on whatever your oven is on, until the kisses get soft, but not melted. Remove from the oven and top each with an M&M, pressing down so the the kiss spreads out a bit. Other than the oven, F&B do these on their own. Gingerbread reindeer were more cookie-ish. Use your favorite gingerbread recipe (or in a pinch, the Pillsbury refrigerated gingerbread is pretty good). 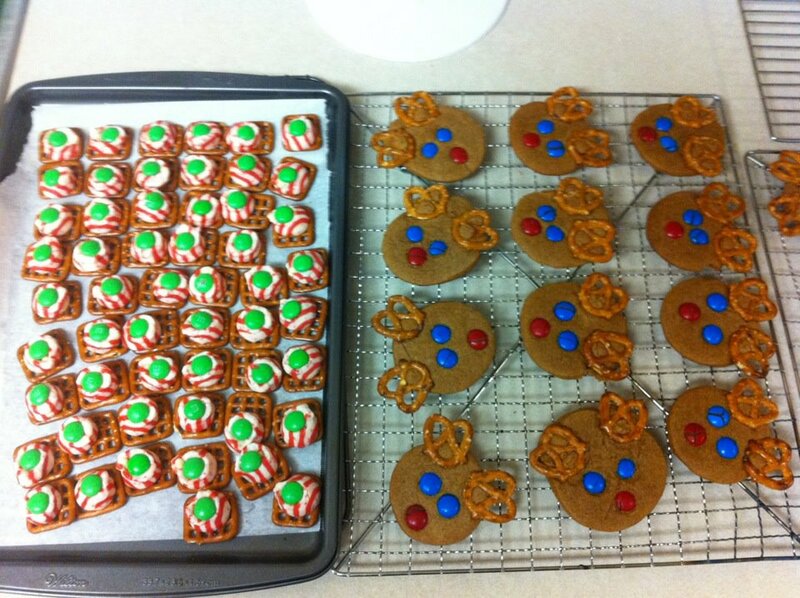 Roll it out, cut circles, decorate with pretzel antlers and M&M eyes and noses, bake per the recipe. For these, I did the cutting, F&B did the decorating. Thank you! They were fun to make with the kids. I have a few others that I made, but it was nice to have a couple that they could be a part of.